Well folks, if the all-touch BlackBerry Z10 isn’t your kind of thing, and prefer the old school BlackBerry handset that made the name so familiar, then the BlackBerry Q10 is surely going to appease your appetite. Quite simply folks, it’s the iconic BlackBerry with a full-sized QWERTY keyboard – so there shouldn’t be too many compromises when it comes to the transition over to the new user experience. Physically, the BlackBerry Q10 is the updated version of the last-generation Bold. To tell you the truth, we loved the sweet industrial design of the Bold 9900 from a while ago, but with the Q10, they’ve brought over many elements that it shares with its predecessor. Checking it for the first time, we can tell instantly that the Q10 is compact in the hand, which is a welcomed relief. Needless to say, it’s not an original design per se, but it’s still lovable due to its impeccable looks and premium set of materials. In fact, the rear casing of the Q10 employs a “glass weave” cover that’s mentioned as being superior to the usual plastic material – plus some stainless steel accents around its trims. Somehow in the back of our mind, we were hoping to see a totally new redesign that’s aggressively differentiated, but it’s merely nothing more than a subtle difference. Can't go wrong with an iconic design, right? Likewise, the keyboard layout is slightly identical, which is a welcome relief. Well, save for the fact that the layout is uniformly straight, as the rows maintain a straight format, as opposed to the slight curve from before. As we’ve pointed out on numerous occasions, the Bold series keyboard has always been a staple amongst QWERTY based devices – and this doesn’t disappoint either! Sure, buttons scrunched next to one another, but they’re individually distinguishable to the touch. On top of that, it responds to presses with that classic tactile feel that we all know and cherish dearly. As much as there’s a huge emphasis regarding BlackBerry 10’s on-screen keyboard, there’s going to be zero learning curve with this physical keyboard. Just like the Bold 9900 before, it takes just a moment to get used to the fact that this QWERTY packing smartphone also carries along a touchscreen. Different from its sibling in the Z10, the BlackBerry Q10 opts for a squarish 3.1-inch Super AMOLED 720 x 720 display. Like most other AMOLED panels, this one radiates with plenty of vibrancy – plus, it helps greatly that its clarity is maintained at all viewing angles. Knowing that its display produces a very respectable pixel density of 360 ppi, we have no issue trying to make out anything on its screen. Interestingly enough, when it comes to typing, you're mainly held to using the physical keyboard, since it doesn't feature an on-screen one. Rather, when you start typing on the QWERTY, it'll provide predictive words to better hasten the process – though, rather than using the swipe up gesture that's used on the Z10 to select a predictive word, all you need to do is simply tap on it. Now it’s a tough call as to which device consumers should go out to get come launch day. On one hand, the BlackBerry Z10 appears to be the flagship device for the new platform, since it soundly makes use of the all-touch functionality that the new platform touts, but at the same time, the BlackBerry Q10 is more of a device that’ll ease that transition to the new platform is you're a hardened BlackBerry user. Quite simply, this is the BlackBerry device that we know and love. So if you have a flare for QWERTY love, this will surely be the handset for you. Yet, it makes us wonder what will be the outcome of the Curve line. Knowing that both the Z10 and Q10 are going to be priced at $200 on-contract, it ultimately come down to if you really want a physical keyboard or not. I think the biggest problem for BB is availability in the U.S. I see further erosion in U.S. market share for BB - all because competing phones will be SHIPPING sooner. agree, but BB might be planning things through, they need to seal their market first outside US, where they are not that damage, and they are still on top! but BB also need to have it available on US market ASAP, before the hype that the new android phones will make! Sorry, Blackberry. Too little, too late. I tried, really, but just couldn't get excited about it. I feel I'm looking at an iPhone, with a virtual BB style keyboard. I just don't see how this new generation is going to succeed in competing with the likes of the GSIII. After reading sloppily written messages clearly composed on glass keyboards, I know why the Q10 is more interesting. Because all other smart phones look the same a rectangle with buttons and the Z10 looks like a iPhone more than anything Samsung made. 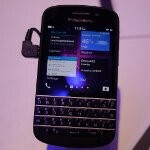 The Q10 looks like an updated Blackberry.. why go out first with the Z10 is beyond me. BlackBerry enthusiasts will be pumped for this one. I wish they had picked a slightly larger screen- a 3.5" to a 3.8" screen might have worked and appealed to a slightly larger group of consumers. But Bold/Curve users are rejoicing, and the Z10 is more for the "new" consumer BB wants. I believe the Motorola Droid Pro had a 3.6" screen, and it was very compact, still. But, no arguments. BB knows their consumers. 3.1" will most likely be enough. This phone is very unique, android phones with similar form factor (atleast the ones in my country) are just entry level phones with modest specs. Not only your country. There is simply no reasonably specked Android with physical keyboard. I know some people will scoff at the screen size, but what similarly speced phone out there, besides the iphone, are at a smaller screen size? None. With android, if you want big specs, you gotta take big size too. Not everybody wants big size. Its good that Blackberry recognizes this and gives us very powerful phones in smaller but still reasonable form factors. Similarly sized androids are usually at BEST mid range specs. I agree!! I had an HTC Status and it was pretty good. I really like the Q10.. just wish it had the WindowsPhone operating system on it. If Nokia or HTC don't come out with a replacement for my DVP, I may have to consider the Q10 though.